Cacti is a free and open source network graphing solution. It uses RRDTool for data gathering and graphing. It provides many features such as remote and local data collectors, network discovery, device management automation, graph templating etc. In this tutorial, we will install Cacti on CentOS 7 server. It is recommended to update the server before installing any package so that the existing packages and repositories are updated. Cacti support all the version of PHP greater than 5.3. But in this tutorial, we will install PHP 7.1 as PHP v5.3 has reached the end of life. Installing the latest version of PHP will ensure the maximum security and performance of the application. The default YUM repository of CentOS does not have PHP 7.1 included, hence you will need to add the Webtatic repository in your system. 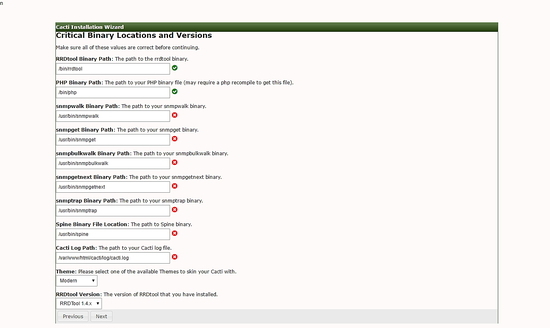 Webtatic repository requires EPEL repository to work. Run the following command to install EPEL repository. Type the commands to install Webtatic repository. Type the following command to install PHP 7.1 along with all the required dependencies. Now you will need to configure few configurations in PHP. Open the PHP configuration file, php.ini using your favourite text editor. In this tutorial, we will be using nano editor. If you do not have nano installed, you can run yum -y install nano. Run the following commands to start MariaDB and enable it to start at boot time. Now run the following commands to secure your MariaDB installation. The above command will run a script to secure fresh MariaDB installation. The script will ask for the existing root user password, we have just installed MariaDB, the root password is not set, just press enter to proceed further. The script will ask you if you want to set a root password for your MariaDB installation, choose y and set a strong password for the installation. Most of the questions are self-explanatory and you should answer yes or y to all the questions. The output will look like shown below. The above command will login to MySQL shell of the root user, it will prompt for the password of the root user. Provide the password to login. Now run the following query to create a new database for your Cacti installation. The above query will create a new database named cacti_data. You can use any other name for your database if you want. Make sure that you use semicolon at the end of each query as the query always ends with a semicolon. Once the database is created you can create a new user and grant all the permissions to the user for the database. To create a new database user, run the following query. The above query will create a user with username cacti_user. You can use any username you prefer instead of cacti_user. Replace StrongPassword with a very strong password. Now provide the all the privileges to your database user over the database you have created. Run the following command. Exit from MySQL prompt using the following command. You will also need to populate the time zone table. Run the following command to populate the timezone tables. Cacti require few more dependencies, run the following command to install them. 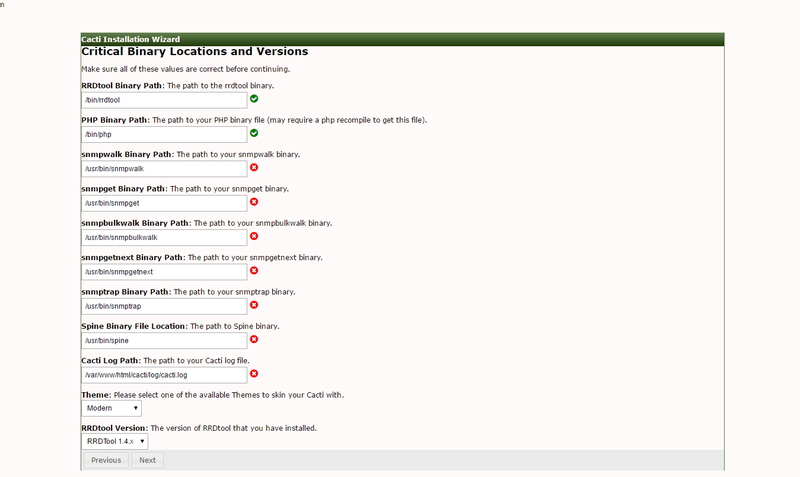 As we have all the dependencies ready, we can now download the install package from Cacti website. You can always find the link to the latest version of the application on Cacti download page. Extract the archive using the following command. Now import the Cacti database by running the following command. The above command will import the cacti.sql database into cacti_data using the user root. It will also ask you the password of root user before importing the database. Now edit Cacti configuration by running the following command. Now find the following lines and edit them according to your MySQL database credentials. Now you will need to disable your SELinux because Proxy configuration does not work with SELinux policies. To temporary disable SELinux without restarting the server, run the following command. Now complete the installation using a web browser, go to the following link using your favourite web browser. Accept the license agreement to proceed further. In next interface you will see the pre-installation, all the required dependencies are met. In installation type, choose New Primary Server and proceed next. In next interface, you will need to provide the locations to the binaries. Path to RRDTool and PHP binaries are correct. For all other binaries, provide the path /usr/bin/binary_name. For example, for snapwalk binary, the path is /usr/bin/snmpwalk. In next interface, you will see that the server has write access to all the required folders. In template setup, choose Local Linux Machine and click Finish. You will be taken to the login page. Login using username admin and password admin, you will be taken to dashboard. Installation of Cacti is now finished, you can use the application to moniter your server using interactive graphs. Is Cacti still actively developed? I'm still more impressed by LibreNMS.